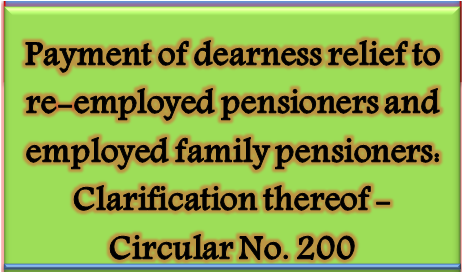 Provisions for payment of dearness relief to re-employed pensioners and employed family pensioners is laid down in Ministry of Personnel, Public Grievances & Pensions (Deptt. of Pension & Pensioners Welfare) OM No.45/73/97-P85PW(G) dated 02/07/1999 issued under this office Important Circular No. 07 dated 13/08/1999. As per the ibid OM, before 18/07/ 1997, in terms of the existing orders, Dearness Relief to pensioners and family pensioners is to remain suspended during the period a pensioner/family pensioner is re-employed/employed under the Central or State Govt. or in a Statutory Corporation/Company/Body/Bank under them in India or abroad. The above facts are also applicable to the pensioners and family pensioners permanently absorbed in Statutory Corporation/Company/Body/Bank under the Central or State Government. 2. Representations from various agencies as well as pensioners/family pensioners including Pension Disbursing Agencies are being received for clarification on Payment of dearness relief to re-employed pensioners and employed family pensioners. The matter has been examined in this office and following points are clarified. (i) In so far as re-employed pensioners are concerned, the entire pension admissible is to be ignored at present only in the case of those civilian pensioners who held post below Group ‘A’ and those ex-servicemen who held post below the ranks of Commissioned Officers at the time of their retirement. Their pay, on re-employment, is to be fixed at the minimum of the pay scale of the post in which they are re-employed. Such pensioners will consequently be entitled to Dearness Relief on their pension. Illustration 1: A Military pensioner was drawing the pay of Rs. 6,330 in the pay scale of Rs. 5,770-140-8,290 from 01/07/2002 and retired from service on 31/ 10/2002 before attaining the age of 55 years. He was granted a military pension of Rs. 3,165. He was re-employed in a Civil Post on 01/12/2003 in the pay scale of Rs. 5,000-150-8,000. The post which the pensioner held in the Army before retirement is a non-commissioned post. If his pay is fix for Rs. 5,600 / - after granting 4 advance increments in re-employed post, then he will be entitled for dearness relief on pension as his pay fix for Rs. 5,600/- in re-employed post is less than Rs. 6,330/- already drawing in the Army before retirement. However, if his pay is fix for Rs. 6,500 / - after granting 10 advance increments in the re-employed post, then he will be not entitled for dearness relief on pension as his pay fix for Rs. 6,500 / - in re-employed post is more than Rs. 6,330 / - already drawing in the Army before retirement as his last pay has been protected. Illustration 2: If the pensioner quoted in Illustration 1 above is re-employed in a Civil Post in the pay Scale of Rs. 7,500-250-12,000, his pay is required to be fixed at the minimum of the pay scale of the re-employed post for payment of dearness relief on pension. Any advance increment granted in such situation, will disqualify dearness relief on pension.